BSNL 3G services introduced new prepaid plan ‘NEW AMOGH’ with Rs.87 Plan Voucher in Karnataka Telecom Circle under GSM Mobile services as promotional basis for a period of 90 days. State runs Telecom Company Bharat Sanchar Nigam Limited (BSNL) has introduced NEW AMOGH Prepaid plan comes with Plan voucher of Rs.87 offers Free 30 minutes to Local/STD to On-net/Off-net with Free 50MB data usage for Prepaid plans users. Prepaid customer under this plan can make voice calls to Local/STD (Fixed/Mobile) @35ps/second to On-net and for Off-net Local/STD (Fixed/Mobile) @45ps/second. Video call Local/STD (On-net/Off-net) charges @4ps/second with Free incoming Video call option. Customer will charge Local/National (On-net/Off-net) @25ps/sms, International @Rs.5 per SMS and Delivery report charges @NIL, Missed Call Alert @Free. 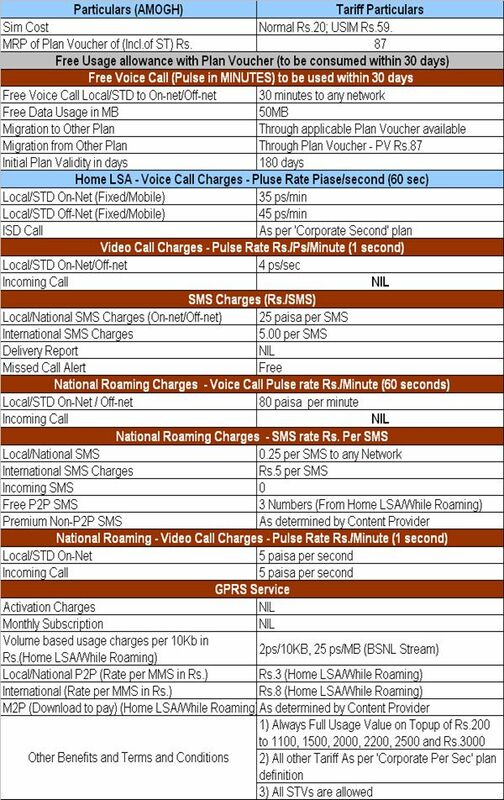 National Roaming voice calls for Local/STD On-net/Off-net @80ps/min with Free National Roaming to receive free incoming call any where in India. National Roaming SMS @25ps/sms, International Rs.5/sms while incoming SMS NIL charges. Prepaid users of other prepaid plans can migrate to this new AMOGH prepaid plan using migration voucher i.e Plan Voucher PV87. Migration from Amogh to other plan is allowed using applicable prepaid plan voucher (Plan Validity Vouchers) available in Karnataka Circle. The above AMOGH (Modified) Promotional offer prepaid plan will be implemented with effect from 30-10-2015 to 27-01-2016 for a period of 90 days under mobile services in Karnataka Circle. Note: The above plans Plan Voucher PV87 is made available for all new and migration customers. All types of STVs are applicable to PV87 plan.